New England (Vermont, New Hampshire, Maine, Massachusetts, Rhode Island and Connecticut) is known for its Fall foliage, and to the locals this time of year is one of the reasons they love their four seasons. Connecticut was the last of the six New England states we would visit while here, and we were looking forward to seeing some fall colors. However, we were advised upon our arrival in Clinton, CT, that it was still “low and pre-peak.” We were here two weeks early – bummer! So why do the leaves change color? 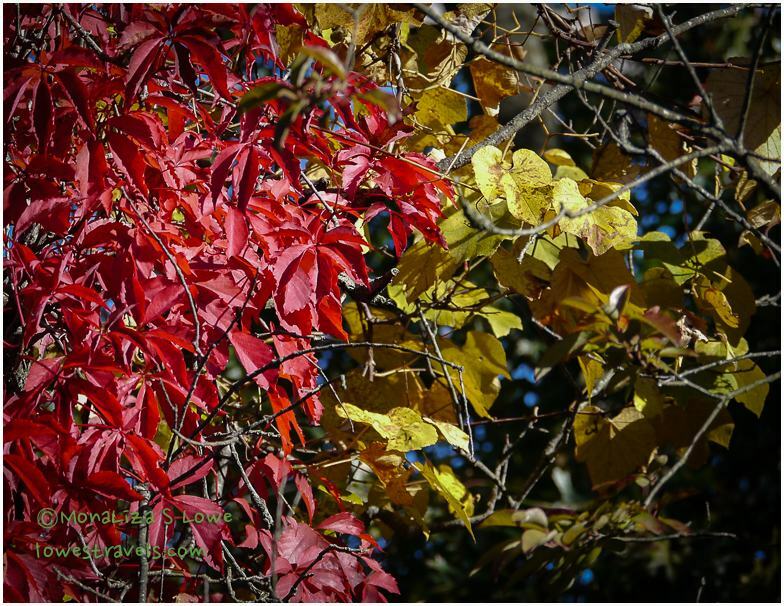 Leaves on the trees already possess these spectacular colors, but they are hidden. Leaves contain a chemical substance called chlorophyll, which gives leaves their inherent green color. As the season starts to turn cold, trees begin to block the flow of water to their leaves. Without water, the chlorophyll breaks down and vibrant colors are revealed in all their splendor. We really wanted to become “leaf peepers”, as they are called here. 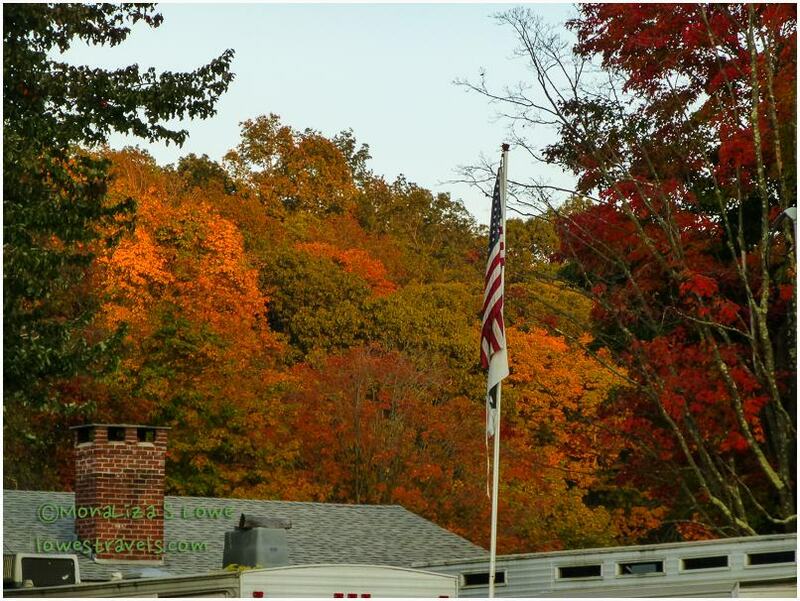 So, I asked our campground host where to best see the colors in the area. She said, “Don’t worry about missing “peak” color. You’ll still be able to enjoy a full array of colors that can be found before “peak”, which is just right around the corner.” At the same time she pointed me behind the office. Nice pond at our campground with some colors. 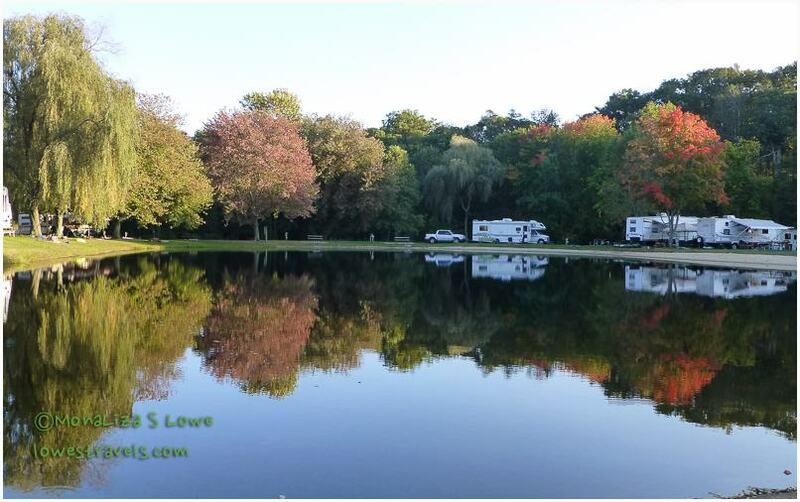 While at Clinton, we stayed at River Dale Farm Campsites (Steve’s campground review is here). Had I not asked at the office, I might have missed the nearby “pond.” And as I continued walking around the body of water, viola – more colors appeared. I was satisfied with my first experience as a leaf peeker. We may have missed some of the splendor of New England, but we’ll certainly see more of this awesome beauty as we continue our slow trek south. 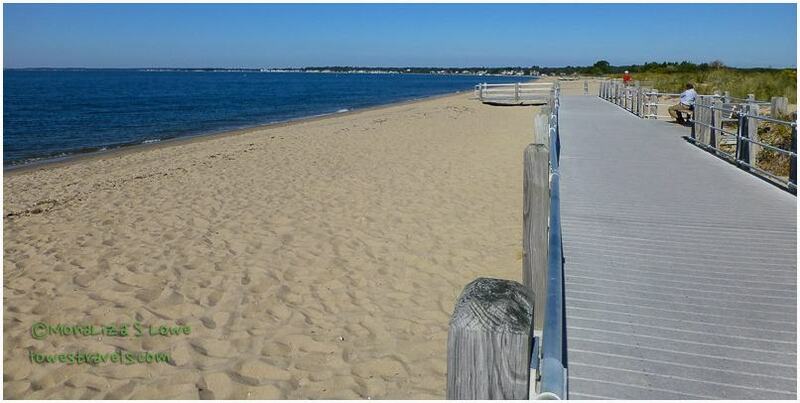 After enjoying the fall foliage at our campground, we set out for the beach! Again? Well, Hammonasset State Beach Park was only 5 miles south of us, so why not? Being late in the season, we got free parking. 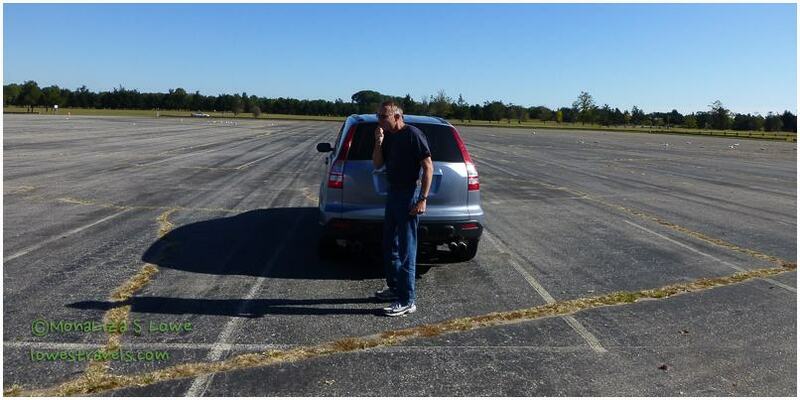 Check Steve out, as he tries to find “just the right spot” in the completely empty and vast parking lot. “OK, this spot looks just right”. Our walk at the beach park was quite interesting. We strolled along the shoreline on the newly-installed boardwalk, then followed the trail leading to extensive salt marshes at the mouth of the Hammonassett River. 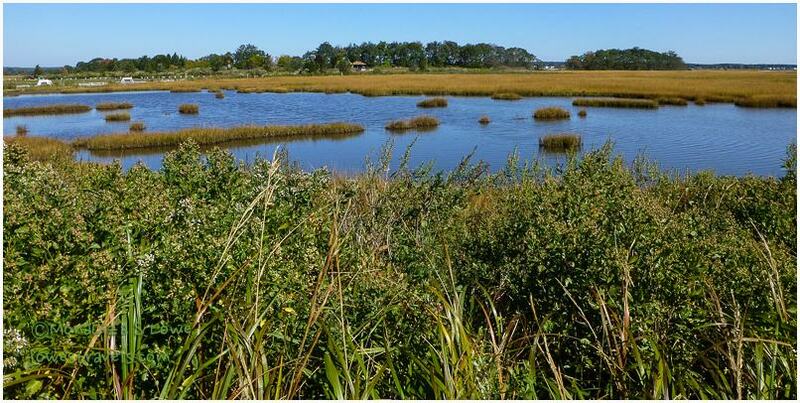 This was the Hammonassett Salt Marsh, a nature preserve area. Very nice boardwalk, right on the beach. The salt marshes at Hammonassett River. 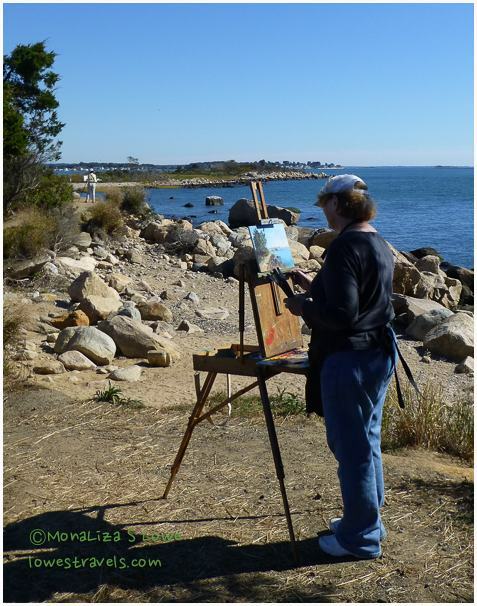 This nature preserve area is also popular with artists, who were busy doing their work near the rocky coastline. On this day we witnessed four of them engrossed with their craft. And just like the birds who stopped here on their way south, we will continue our southward migration. It was a great fall day to enjoy the gorgeous weather while leaf peeping and beach walking. Next up: Hanging out in the Big Apple, baby! After experiencing and loving the natural beauty of Mount Desert Island and Acadia National Park, we traveled only 20 miles south of our campground to be amazed by a man-made wonder and engineering feat. 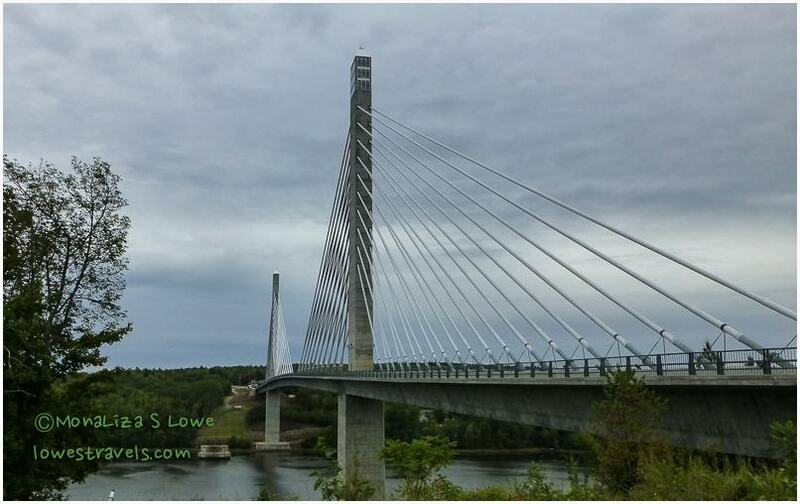 The Penobscot Narrows Bridge is a structural beauty spanning 2,120 feet over the Penobscot River. It connects the towns of Prospect and Verona Island, Maine, on highway 1. These are quaint, rural towns where you don’t expect to see a stunning structure such as this peeking out over the treetops. 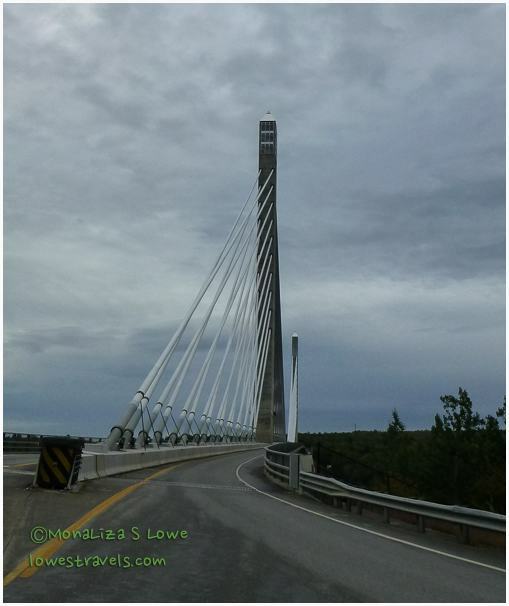 The bridge is Maine’s first cable-stayed bridge, and one of only three bridges in the U.S. that are similarly constructed. The span consists of 181 segments like the one pictured below, suspended on cables from the 447-foot tall concrete pylons. 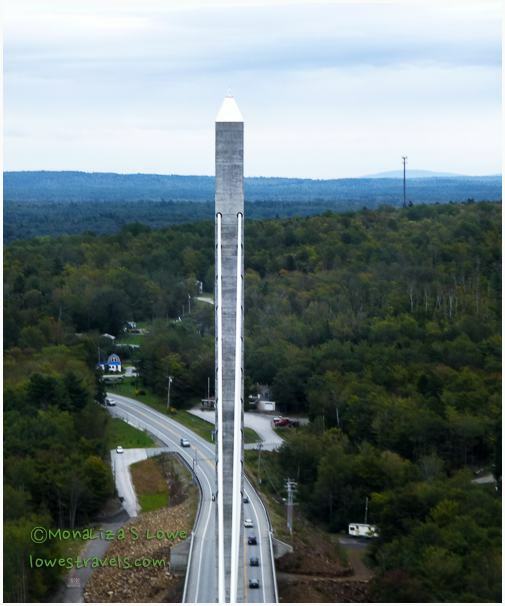 And the best part is we were able to enjoy a 360-degree view of the surrounding area from the Penobscot Narrows Bridge Observatory. 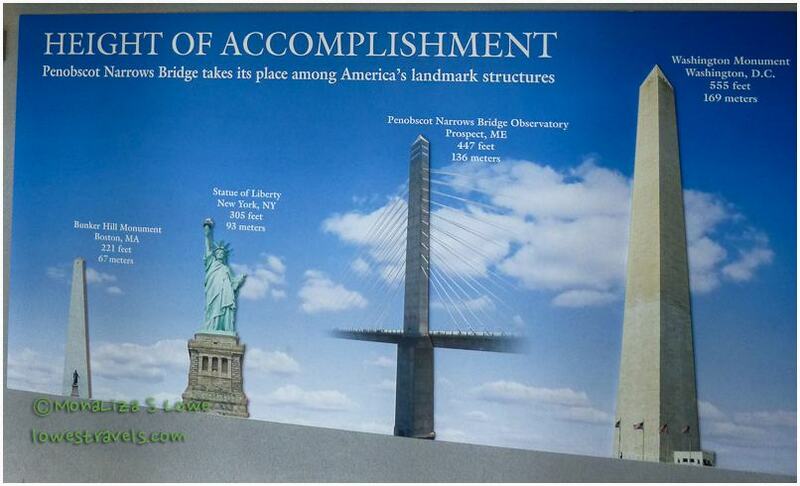 It is the tallest bridge observatory in the world, and open to the public with access to the top deck, which sits 447 feet above the Penobscot River. The observatory is accessible only through Fort Knox (not THE Fort Knox, more later), so after paying a very reasonable $7.00 per person to access the observatory AND the fort, up we went on our one-minute ride straight to the top. 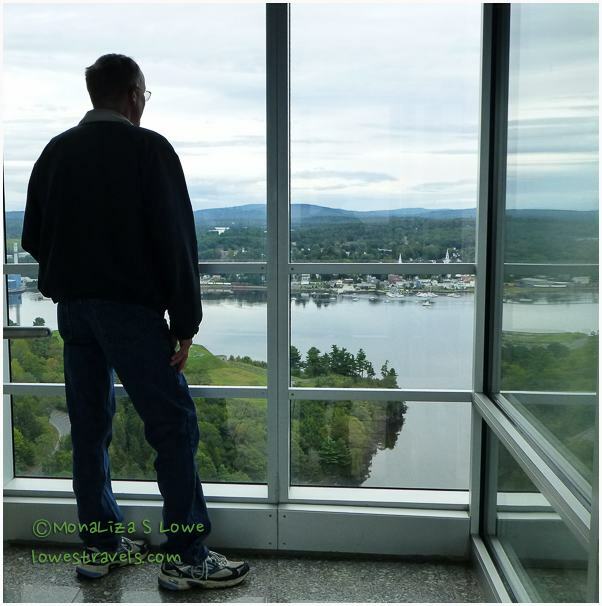 When the elevator doors slid open we were faced with a dizzying view of the Penobscot river. We climbed stairs two more levels and were faced with an awesome view of the surrounding countryside – mountains, hills and lots and lots of trees. Northwest view, with Cadillac Mountain in the distance behind that cell tower. 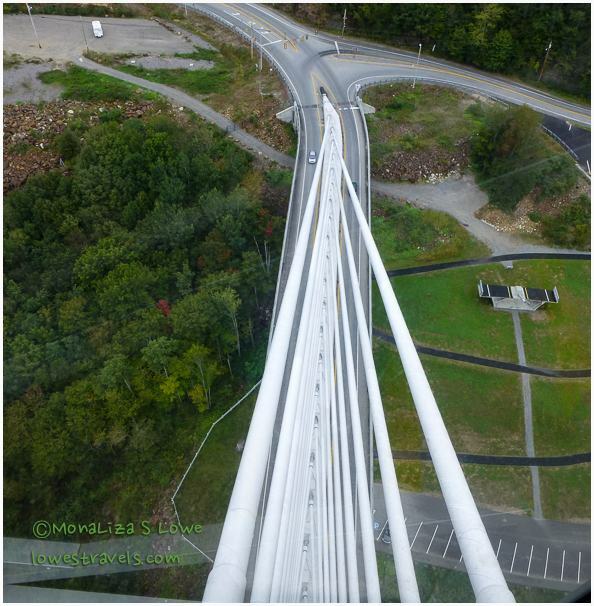 Looking down at the cable arrangement – this bridge is amazing! View to the east – Penobscot River, a paper mill and the town of Bucksport. “The other” Fort Knox in the foreground. 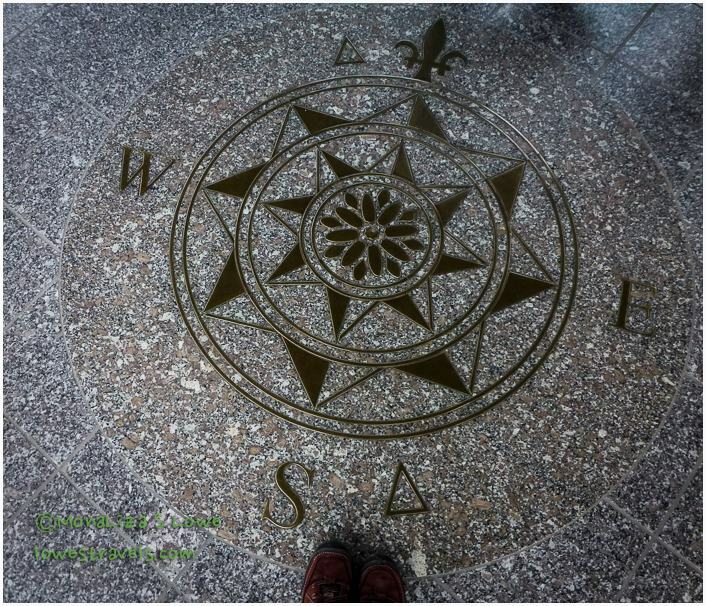 A beautiful inlaid bronze compass rose, taken from a 1613 map created by Samuel de Champlain, can be seen on the top deck floor of the observatory. One last look at that bridge on the way across. We were surprised to learn that it took only 42 months from conception to opening day in 2006 to complete this bridge and observatory – practically unheard of these days! It had to be built quickly after it was discovered that the existing Waldo–Hancock Bridge was rapidly failing due to corrosion. The beautiful and graceful design also turned out to be the easiest and most economical to construct in a hurry, costing only $86 million. There’s not even a toll to cross this bridge – excellent! We never got tired of hanging around this bridge. After a dizzying time at the observatory, we swung by Fort Knox (not to be confused with the one in Kentucky storing all that gold) just a few hundred feet away. 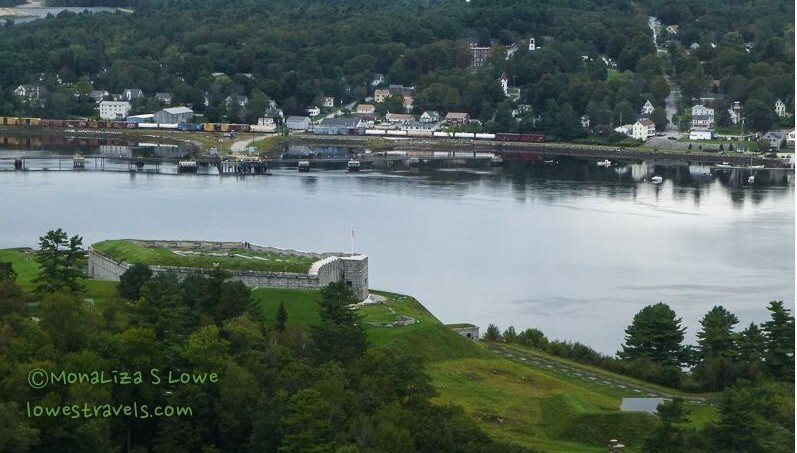 It is a military installation built in 1844 to protect the Penobscot Valley and one of the best preserved fortifications on the New England seacoast. We’ve visited many forts during the past year and a half, yet we continue to enjoy checking out each one along our route. They all have their unique battery of cannon and neat architecture – this one is almost all solid granite, since the stone is plentiful in the nearby mountains. Of course, the story of each fort is different and interesting to learn. 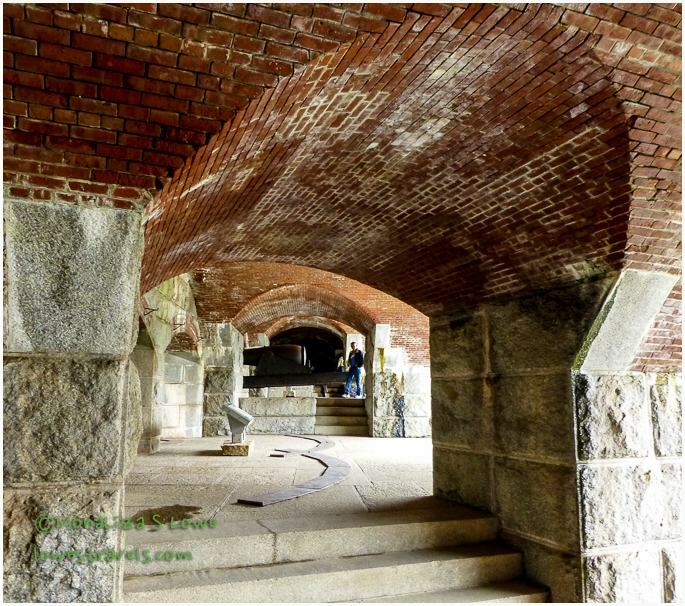 It’s hard to imagine the sound and vibration that a large cannon blast would send through these archways (called casemates). Supply officer Lowe reporting for duty, sir! It seems like it must have taken the granite from an entire mountain to build this place! 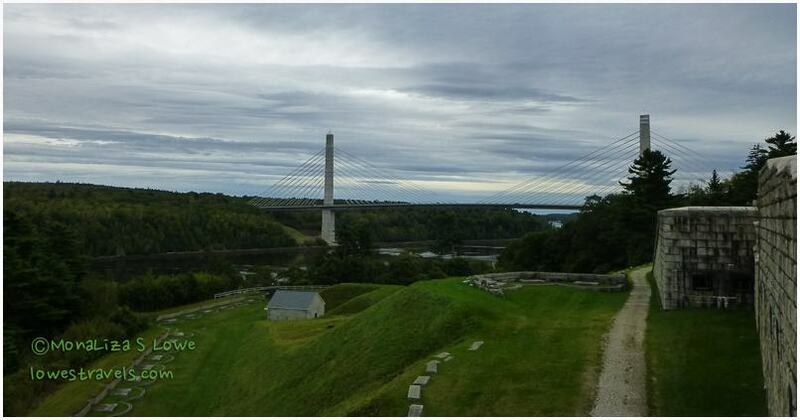 The fort, bridge and observatory – a must-see in this area! The views were excellent despite the overcast sky, and in just a few hours we got to explore and be amazed by these man-made creations. When you think of Maine, lobsters probably come to mind along with ocean breezes – maybe even the sight of lobster boats trawling on the ocean. It may be difficult to imagine that among the rolling hills and just a few miles from the coast is a desert. 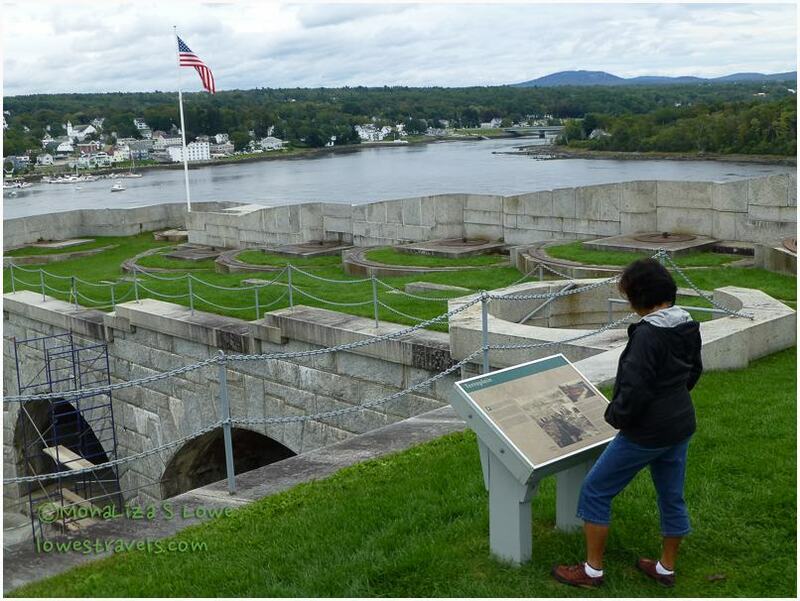 We were not looking for this desert, but it just happened to be next door to our RV Park – Desert of Maine RV Park (reviewed here). We were so intrigued that as soon as we settled in we immediately caught a tour to see for ourselves what they are bragging about. And sure enough, there it was! This post shows how the moving sand dune has covered a water spring and drinking station that lie below. It is not really a true desert by weather standards, but is otherwise considered a desert. This tract of land is now covered with a sandy substance known as glacial silt (called “mica”), which has developed into dunes 80 ft deep. Centuries before, topsoil formed a cap concealing the desert, enabling a forest to grow. In 1797 Mr. Tuttle farmed this land, but poor crop rotation techniques and over-grazing resulted in soil erosion, and one day a patch of sand became exposed. It continued growing until the sand claimed the farm, swallowing buildings and pastures. Because he could not contain it, Mr. Tuttle sold the 300 acres of land for $300. Mr Goldrup bought the farm and saw a potential, and in 1925 opened the area as a tourist attraction. So that is how the Tuttle Farm of 1783 to 1919 became a Desert of Maine since 1925. Our first lobster roll, the best in Freeport! After that excitement we ventured out and began the search for a good lobster roll, live fresh lobsters, lighthouses, boats and ships and oh, maybe some shopping too. A trip to Freeport would be incomplete without a stop at the mothership of shopaholics, L.L. Bean, which has had its headquarters here since 1917. We indulged in some needed clothing, and since lunchtime was approaching we searched for Derosier’s Cafe, recommended by the cashier at LLBean. We were told they serve the best lobster roll in the area for only $9.95, and it certainly was delicious! A great hole-in-the-wall restaurant among many fancy places. We drove to Cape Elizabeth Light – also known as Two Lights – where two light towers, about 300 yards apart, are located. Built in 1828 and rebuilt in 1874, were sold several times and now sit on private property. Only the eastern tower of the two that made up the light station until 1924 is active. The western tower is deactivated, but it is still standing and is privately owned. We were disappointed that we couldn’t get all the way up to the structures and would not recommend driving too far our of your way to see them. This area along the ocean coast is also known for its rocky outcroppings that jut out to the ocean. One of the most popular landmarks along the shores of Maine is the Portland Head Light. It is the state’s oldest lighthouse built in 1791 and sits in Fort Williams Park, on a head of land at the entrance to the primary shipping channel into Portland Harbor. 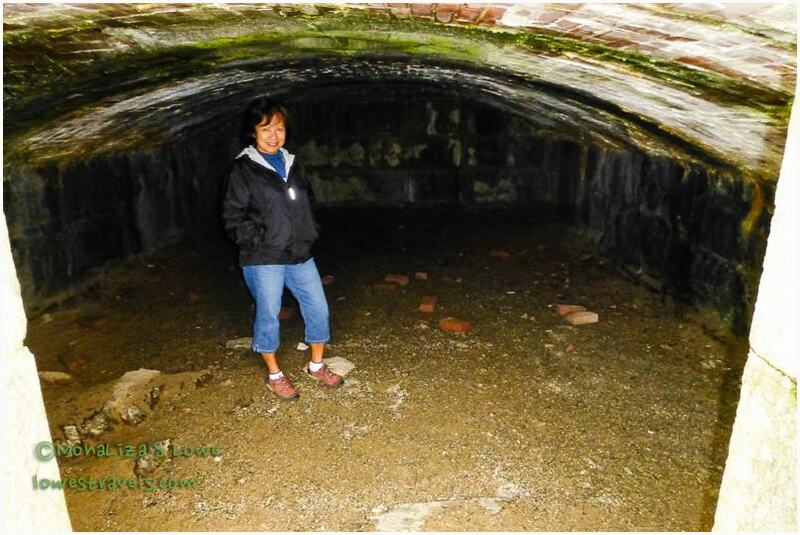 It is located within Casco Bay in the Gulf of Maine. An active lighthouse, it is now automated and the tower, beacon, and foghorn are maintained by the United States Coast Guard. We followed a trail which gave us various views of the lighthouse as we explored the rocky shores. Bath, Maine is known as the “City of Ships” for its shipbuilding history dating back 400 years. It is home to Bath Iron Works (BIW) where we joined a one-hour trolley tour that took us behind the gates of “The Works” to see how modern U.S. Navy destroyers are built. We learned why the phrase “Bath Built is Best Built” rings true at this ultra-modern facility. Photography is prohibited on the tour, so we sat in rapt attention as the guide narrated the various stages of shipbuilding which he likened to assembling lego blocks. The size and scope of work performed at this facility is staggering. They are just now building two of the Navy’s newest destroyers – the DDG 1000 Zumwalt, and the next Arleigh Burke class ships. Pulling alongside an 800+ ft. long destroyer in drydock is enough to take anyone’s breath away. Don’t miss this one! The Big Blue dry dock, 750 ft long, 144 ft wide between walls, 52 ft high and can lift 28,000 long tons – made in China! The huge blue box in the picture is a floating dry dock, used for launching the ships after their hulls are complete. When ready for launch, a completed ship is moved into the dry dock by means of a hydraulic trolley system. There the vessel rests on temporary cradles and blocking until it can float away. The dry dock sinks by pumping river water into its tanks, and floats again by pumping water out. Since admission to the Maine Maritime Museum next door is included in the ticket price ($35 per person), plan to spend several hours here if you can. The area’s nautical history is chronicled in detail, and there are several impressive displays. On the center of the grounds is the largest sculpture in New England, a life-size representation of the Wyoming. It was the largest wooden sailing ship ever built, at 426 feet from tip of bowsprit to stern rail. It had six masts, each 177 feet tall! My photo below can not convey the size of this sculpture, but believe me it is impressive. The sculpture stands on the same spot where the schooner was built in 1909 and is of the same size as shown on the picture below. Although we aren’t boat fanatics, we found the displays about boat building on this 20-acre campus to be quite interesting. The self-guided tour includes the history of the lobster industry and how it became a staple and symbol of Maine. After touring and sightseeing, its time to go to the market and get some seafood…lobsters, that is! This happy person has a bag of fresh seafood! Lobsters for dinner – again? 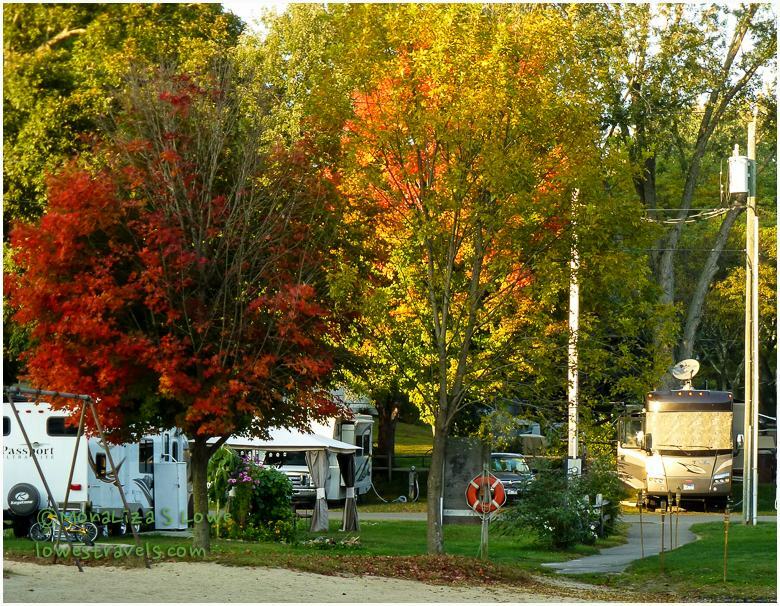 After admiring lighthouses and the coastline (not to mention satisfying our lobster cravings), we moved to Bangor, Maine and stayed at Pumpkin Patch RV resort. We spent a couple of days trip planning and preparing Betsy for our border crossing into Canada. We are now dependent on the internet offered at RV parks in Canada, which is really spotty. Hence my story telling may be somewhat delayed during the next few weeks. Oh the tribulations of international travel! Heading into Vermont, our minds and plans were fixated on yummies like ice cream and cheese (more on that later). Little did we know that the museum our friend Don from Ohio recommended to us was the real gem. We had been to so many museums in our travels that we thought, “how different can it be?” Well, we found out after spending an entire day there – from opening to closing! For $22 per adult, you can explore and enjoy the museum for two days – and it could take that long if you are really into the many varied items they have on hand. We did it in one day, but we were exhausted from being on our feet for 7 hours straight. Shelburne Museum is a museum of art and Americana located on 45 acres in Shelburne, VT. Over 150,000 works are exhibited in 39 exhibition buildings, 25 of which are historic and were relocated to the museum grounds. All collections are exhibited in a village-like setting of historic New England architecture, accented by a landscape dotted with colorful flowers. It is an unconventional but very well done collection. Electra Havemeyer Webb (1888-1960) was a pioneering collector of American folk art and founded Shelburne Museum in 1947. She had been collecting 18th- and 19th-century buildings from New England and New York in which to display her collection, even relocating 20 historic structures to Shelburne. On the grounds we saw the relocated houses, barns, a meeting house, a one-room schoolhouse, a lighthouse, a jail, a general store, a covered bridge, and oh yeah, the 220-foot steamboat Ticonderoga. View of the collections of houses, barns and buildings as seen from Colchester Reef lighthouse. The restored 220-foot steamboat Ticonderoga is a National Historic Landmark and one of only two remaining walking beam side-wheel passenger steamers in existence. Just the story of how this boat was moved here is amazing. It took months to dig a two-mile channel, fill it with water and then pull the boat along with a pair of locomotives. It was such a lovely sunny day to walk around the museum grounds, and we were fortunate to catch one of the 2 tours of the Ticonderoga – we just happened aboard at the right moment! The 220-foot steamboat Ticonderoga, built in 1906 and restored in 1955. The thousands of pieces displayed in each restored house, building or barn are astonishing. We have never seen anything like it – the general store and apothecary (pharmacy) are by far the most complete and authentic we have seen. Just the construction of the round barn and horseshoe-shaped barn are amazing, not to mention the huge collection of hundreds of carriages and sleighs stored within them. Whatever passion, interest or obsession you may have, this museum seems to cover them all. Below are pictures of just some of the collections. Horseshoe Barn contains the carriages, wagons and sleighs of different eras. The rich collections pictured below were housed in separate buildings or houses. More dolls than we’ve ever seen! On display in the weaving building is a rare 1890s Jacquard Loom, which used punched cards to create intricate designs in the cloth. These punched cards are actually the pre-cursors to punched cards used at the beginning of the computer revolution. Dozens more carriages inside the Round Barn – Steve is becoming a big fan of carriages! A horseshoe-shaped structure called the Circus Building was constructed in 1965 and was designed to showcase a 4,000 piece hand-carved miniature Arnold Circus Parade. The collection stretches nearly the full length of the building’s 518 feet. These miniatures ran the entire length of the building! Finally, an intricate 3,500-piece miniature three-ring Kirk Bros. Circus is displayed at the end of the building. Absolutely amazing display! Whew…there was so much to see and gawk at! And if you feel cultured and into fine art, there was a building for that, too – but photography was not allowed and the high-end collection was closely guarded. After seeing all of it in seven hours, you may ask if we have a favorite among the collections? I would say no, it was so diverse, so interesting and so fascinating that we could not really pick a favorite. And I have not even mention everything we saw, so if you happen to be in Vermont, make Shelburne Museum at the top of your list. By 5pm we were exhausted and ready to sit down by the campfire to enjoy our wine and Vermont cheeses. Ahh…the cheese in Vermont – stay tuned. Next Up: Ice cream, cheese and teddy bears under construction!